All right - now I have seen everything. 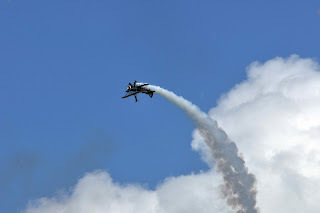 I was taking pictures of this stunt plane. It was cool. But not terribly exciting. Until I looked at my images. There is someone on the wing. Click on the pic and see. I was not on post - so I did not hear that there was a person on the wing. Found out - this is a husband and wife team. WOW. That is the insane part of this photo.